You are here: Home / Podcasts / Episode 111: The Truth? 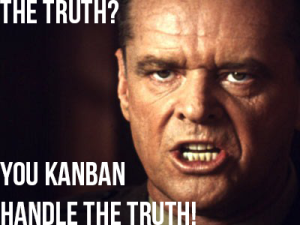 You Kanban Handle The Truth! Episode 111: The Truth? You Kanban Handle The Truth! If you’ve gotten value from our show over the last 100+ episodes, we’d love for you to help support the show on Patreon! Brecht gets a message from a long time pal about liquidating some properties. Is Brecht getting back into real estate? Maybe just a foot back in, but he’s applying a lot of what he’s learned with DistressedPro on this quick venture to liquidate these properties fast. Scott has a great open rate for his LinkedIn outreach and he’s still getting good responses. Hear about a friend who replied and is working at a top company, in a great position, and exactly why Scott left that life and began to bootstrap it! The dilemma of dedicating time to Blackfin or SysDoc sounds like a great problem to have now!